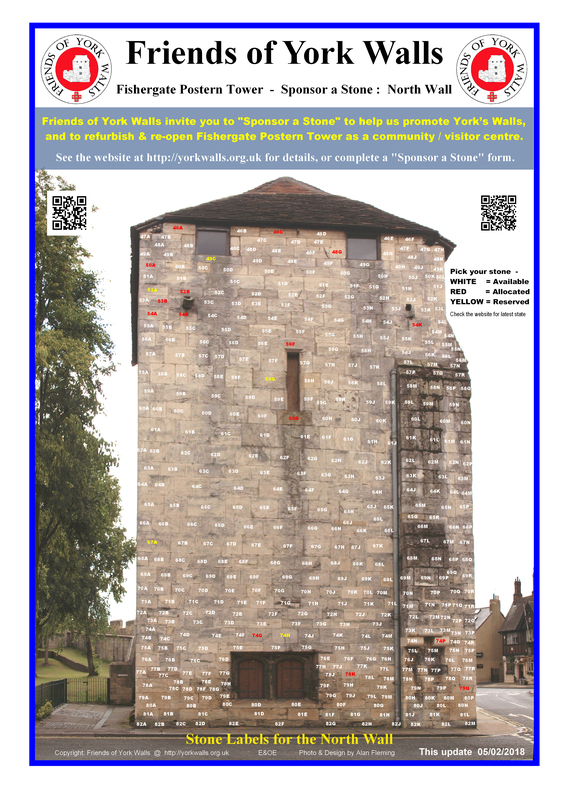 Friends of York Walls are continuing to work towards the refurbishment and ultimate re-opening of Fishergate Postern Tower. One of the ways we are seeking to raise funds is by inviting the general public and local businesses to “Sponsor a Stone”. This major fund raising activity was officially launched in January 2012 when The Lord Mayor of York was presented with a certificate of ownership of the first stone. The North Wall stones are numbered 46A to 82M. 1. To Sponsor a Stone – look at the photograph below for the North Wall and pick a free stone – i.e. one with a white label. Click on the photo to view in high resolution. NOTE that this photo will not be as “up to date” as the on-line availability grid below. 2. Check on the North Wall Sponsored Stones Grid below that the chosen stone is still un-allocated in the live database. GREEN stones are available. 3. To reserve an available stone online, please use the Online Stone Reservation Form. A minimum donation of £20 is requested, but more would be greatly appreciated. 4. If you are unable to complete all the required information online you can make a Postal Application. Please print out and complete the postal application form, and return it to the address specified on the form. A minimum donation of £20 is requested, but more would be greatly appreciated. Once the database has been updated you will be able to see the sponsors name, and any optional message you entered on the application form, by hovering over your stone reference number on the North Wall “availability grid” above. View the North Wall Online Sponsors Book here. Online Payment by Credit / Debit Card is made through the PayPal facility, but you do NOT need a PayPal account to make a card payment. An email will be sent automatically to you to confirm receipt of your payment. If you do not wish to pay through the PayPal facility, you can send a bank transfer as per the instructions on the postal application form or post a cheque to the address specified on the form. Please reference your payment with the stone number(s) you are paying for.